Sawyer Brown is an American country music band founded in 1981 in Apopka, Florida, by five members of country pop singer Don King's road band: Bobby Randall (guitar) and Jim Scholten (bass guitar), both from Midland, Michigan; Joe Smyth (drums), Gregg "Hobie" Hubbard (keyboards) and Mark Miller (lead vocals). Taking their name from the Nashville street where they once rehearsed, Sawyer Brown made their national TV debut on the show Star Search in 1984. After winning $100,000, the band landed a record deal with Curb Records and charted its first single, "Leona," the same year. Following up with pulsating party songs "Step That Step" and "Betty's Bein' Bad," Sawyer Brown won the Country Music Association's Horizon Award in 1985. Although the band continued to tour and churn out singles through the late '80s, Sawyer Brown had only sporadic hits (1987's "This Missin' You Heart of Mine" and 1989's "The Race Is On") until "The Walk" in 1991. The poignant song of a father-son relationship began a string of Top 5 hits that continued until 1995. During that time, the band's music changed somewhat, drifting from high-energy fun tunes to more thought-provoking fare like "The Dirt Road," "Café Down on the Corner" and "All These Years." In 1997, Sawyer Brown were named the Academy of Country Music's top vocal group for the year 1996. The band also has taken home six consecutive TNN/Music City News Awards top vocal band prizes. Sawyer Brown were one of the first country acts to use music videos to full advantage. From the start, their videos were built around concepts, rather than on straight performances. The videos also involved famous guest stars, among them the comedian Gallagher and wiseguy weatherman Willard Scott. The videos showcased frontman Mark Miller's boundless stage energy and demonstrated that the other members were having great fun playing together. Some took on a serious tone. "The Walk" chronicled the relentless march of aging. "Cafe on the Corner" focused on the agony of people dispossessed and out of work. "All These Years" examined without sentimentality a marriage crumbling into desperation and despair. With "The Other Side," the band used a Civil War scenario to illustrate that blood is thicker than politics. Four of Sawyer Brown's videos -- including the rollicking "Some Girls Do" and "Six Days on the Road" -- have earned CMT video of the year awards. Remarkably stable in a notoriously unstable business, the band has lost and added only one member in its more than 17 years of recording and touring. Original members include lead vocalist Miller, keyboardist Gregg (Hobie) Hubbard, drummer Joe Smyth and bassist Jim Scholten. Guitarist Bobby Randall left the band in 1991 and was replaced by Duncan Cameron, formerly of the Amazing Rhythm Aces. 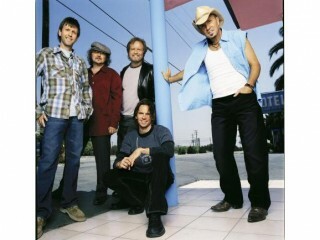 Sawyer Brown have released 17 albums, among them two studio greatest hits packages and a Christmas album. A third best of collection, The Hits Live, was released in 2000 and included a remake of the 1980 Johnny Lee hit "Lookin' for Love." The band signed to Lyric Street Records in 2003, but did not release an album on that label. However, Miller has found success in the Christian market by producing an album from the band Casting Crowns, released on Miller's label. Guitarist Shayne Hill joined the band in 2004. A new studio album, Mission Temple Fireworks Stand, was released on Curb in 2005. View the full website biography of Sawyer Brown.